Sitting on the banks of the Ganda river estuary, the town of Kalas has a population of some 8,000 souls. The Town sees a great deal of business pass through its gates; river barges coming down from the lakes, seagoing merchant vessels and privateers, as well as caravans coming in from the Ust-Aan steppes. The town serves as a trading centre, a rest stop, and as a place to refit vessels, caravans and parties of adventurers. In Kalas, dusky islanders and ebony visitors from the Dark Continent mingle with steppe men, pale blonde barbarians from the north, and the swarthy, warm-eyed locals. Grass elves, their skins painted brown and green -- grey elves from the forest, even sea elves from the shore bargain in the bazaar with Ebony dwarves from the desert, pale Dwarves from the north, leaf gnomes, marsh Halflings and the dark skinned Halfling wanderers from far distant veldts. Kalas is THE location for an adventuring party. Walking in from little villages off the river, or arriving by ship or caravan, the characters can begin to hunt about and purchase equipment, find a place to stay and have fun crawling the bars. Every location and every character here have been created with the potential for adventures! This is a sandbox adventure setting. 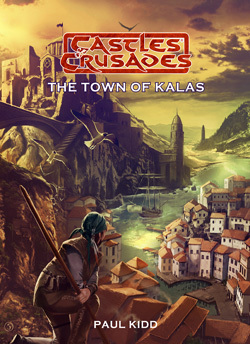 Written by Paul Kidd, the Town of Kalas is a wonderfully contained town setting, easy to port to any game. It includes all the details on the town, with maps, as well as everything you need to on the major NPCs. The Town of Kalas is filled with hosts of adventure hooks, good for long range campaigns or short one night adventures.